Interactive queries allow you to leverage the state of your application from outside your application. The Kafka Streams API enables your applications to be queryable. The full state of your application is typically split across many distributed instances of your application, and across many state stores that are managed locally by these application instances. There are local and remote components to interactively querying the state of your application. An application instance can query the locally managed portion of the state and directly query its own local state stores. You can use the corresponding local data in other parts of your application code, as long as it doesn’t required calling the Kafka Streams API. Querying state stores is always read-only to guarantee that the underlying state stores will never be mutated out-of-band (e.g., you cannot add new entries). State stores should only be mutated by the corresponding processor topology and the input data it operates on. For more information, see Querying local state stores for an app instance. Connecting these fragments enables communication between instances of the same app and communication from other applications for interactive queries. For more information, see Querying remote state stores for the entire app. Kafka Streams natively provides all of the required functionality for interactively querying the state of your application, except if you want to expose the full state of your application via interactive queries. To allow application instances to communicate over the network, you must add a Remote Procedure Call (RPC) layer to your application (e.g., REST API). This table shows the Kafka Streams native communication support for various procedures. 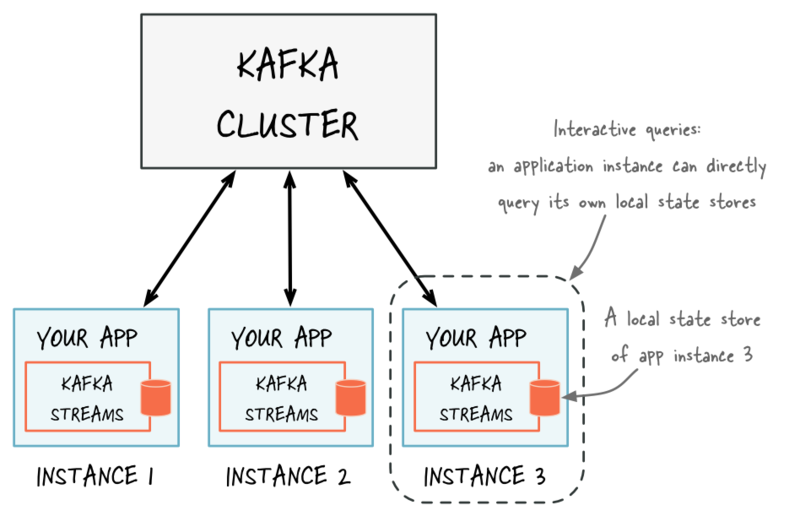 A Kafka Streams application typically runs on multiple instances. The state that is locally available on any given instance is only a subset of the application’s entire state. Querying the local stores on an instance will only return data locally available on that particular instance. 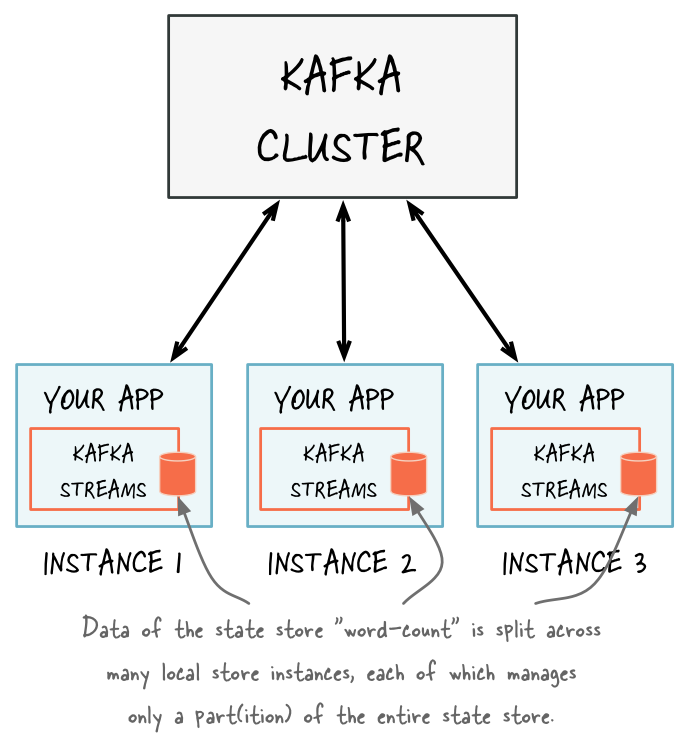 The method KafkaStreams#store(...) finds an application instance’s local state stores by name and type. The name of a state store is defined when you create the store. You can create the store explicitly by using the Processor API or implicitly by using stateful operations in the DSL. Kafka Streams materializes one state store per stream partition. This means your application will potentially manage many underlying state stores. The API enables you to query all of the underlying stores without having to know which partition the data is in. To query a local key-value store, you must first create a topology with a key-value store. This example creates a key-value store named “CountsKeyValueStore”. This store will hold the latest count for any word that is found on the topic “word-count-input”. A window store will potentially have many results for any given key because the key can be present in multiple windows. However, there is only one result per window for a given key. To query a local window store, you must first create a topology with a window store. This example creates a window store named “CountsWindowStore” that contains the counts for words in 1-minute windows. Only the Processor API supports custom state stores. You must have an interface to represent the operations available on the store. You must provide an implementation of StateStoreSupplier for creating instances of your store. It is recommended that you provide an interface that restricts access to read-only operations. This prevents users of this API from mutating the state of your running Kafka Streams application out-of-band. Provide a wrapper class that has access to all of the underlying instances of the store and is used for querying. A wrapper class is required because each instance of a Kafka Streams application may run multiple stream tasks and manage multiple local instances of a particular state store. The wrapper class hides this complexity and lets you query a “logical” state store by name without having to know about all of the underlying local instances of that state store. When implementing your wrapper class you must use the StateStoreProvider interface to get access to the underlying instances of your store. StateStoreProvider#stores(String storeName, QueryableStoreType<T> queryableStoreType) returns a List of state stores with the given storeName and of the type as defined by queryableStoreType. To query remote states for the entire app, you must expose the application’s full state to other applications, including applications that are running on different machines. Add an RPC layer to your application so that the instances of your application can be interacted with via the network (e.g., a REST API, Thrift, a custom protocol, and so on). The instances must respond to interactive queries. You can follow the reference examples provided to get started. Expose the RPC endpoints of your application’s instances via the application.server configuration setting of Kafka Streams. Because RPC endpoints must be unique within a network, each instance has its own value for this configuration setting. This makes an application instance discoverable by other instances. In the RPC layer, discover remote application instances and their state stores and query locally available state stores to make the full state of your application queryable. The remote application instances can forward queries to other app instances if a particular instance lacks the local data to respond to a query. The locally available state stores can directly respond to queries. There are many ways to add an RPC layer. The only requirements are that the RPC layer is embedded within the Kafka Streams application and that it exposes an endpoint that other application instances and applications can connect to. To enable remote state store discovery in a distributed Kafka Streams application, you must set the configuration property in StreamsConfig. The application.server property defines a unique host:port pair that points to the RPC endpoint of the respective instance of a Kafka Streams application. The value of this configuration property will vary across the instances of your application. 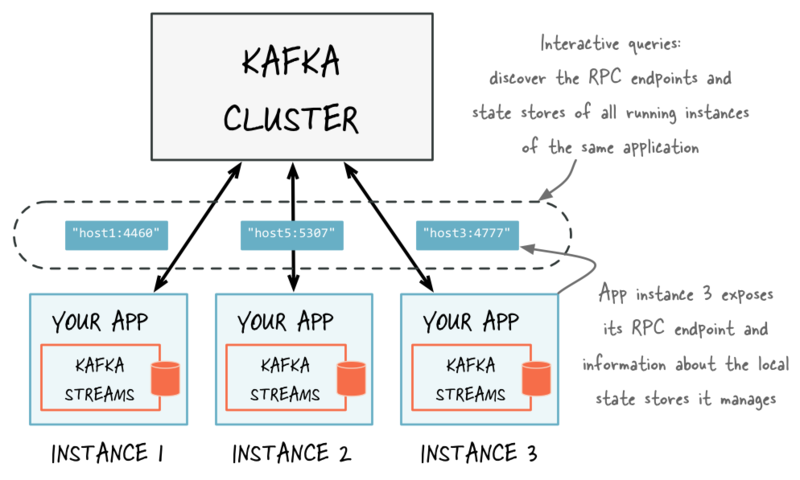 When this property is set, Kafka Streams will keep track of the RPC endpoint information for every instance of an application, its state stores, and assigned stream partitions through instances of StreamsMetadata. Consider leveraging the exposed RPC endpoints of your application for further functionality, such as piggybacking additional inter-application communication that goes beyond interactive queries. This example shows how to configure and run a Kafka Streams application that supports the discovery of its state stores. // The state store is discoverable and can be queried interactively. The following methods return StreamsMetadata objects, which provide meta-information about application instances such as their RPC endpoint and locally available state stores. You can discover the running instances of the application and the state stores they manage locally. Through the RPC layer that was added to the application, you can communicate with these application instances over the network and query them for locally available state. To see an end-to-end application with interactive queries, review the demo applications.